In the wake of Jack Lester’s departure, caretaker manager and club veteran Ian Evatt has thrown his hat into the ring of potential next gaffers of Chesterfield Football Club. An old-fashioned centre-half with experience at the very top and very bottom of the Football League and who has even been likened to Andres Iniesta with that no-look pass, ‘Evo’ has seen it all during his lengthy playing career. After refusing to rule himself out of contention for the manager’s role, he confirmed his bid when he told the Derbyshire Times’s Graham Smyth that he feels cut out to be the next Spireites boss, and when his key obstacle was mentioned, he said that inexperience shouldn’t rule him out. To a large extent, Evatt has a genuine argument. Lack of experience doesn’t necessarily determine failure. Eddie Howe’s remarkable revival of Bournemouth in his managerial debut half-season in 2009 is a timely reminder that sometimes experience doesn’t matter. Despite a 17-point deficit in the League Two relegation zone, then-32-year-old Howe steered the Cherries towards safety from relegation to the non-League. Seven seasons later, Howe was in the technical area for Bournemouth’s first ever Premier League appearance. This is no indication that Evatt’s future will run parallel, but it is certainly the greatest evidence that, sometimes, taking a risk with a newbie can reap rewards. Having said that, we’ve already been there with Jack Lester, a man who perhaps was dealt a poor hand rather than didn’t have the ability to rescue the sinking ship. But as we have learned all too well, the club’s situation plays a role just as much as the manager’s skills. Should the club have been in a better financial and organisational position, Lester may still be at the Proact, and Chesterfield may still be a Football League club. Being realistic, however, finances will not be bountiful and appointing a manager with the ability to utilise whatever budget he is dealt is a crucial move. Whether or not Evatt will be able to make the most of a slashed budget is yet to be known. And although experience doesn’t always matter, it will most likely take a lot of experience to turn around Chesterfield’s collapse down the leagues. 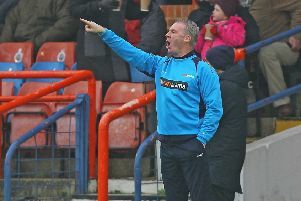 Ronnie Moore and former Spireites boss John Sheridan - two other contenders for the job - have what it takes to change fortunes, having both saved clubs from relegation fights and turned form around. Nicky Law, too a former Chesterfield manager, has extensive knowledge of the non-League, though his cosy recruitment job under Sean Dyche at Burnley will make him tougher to appoint. Moore will also have some advantage over others in terms of non-League experience, having most recently managed National League side Eastleigh. Also in the mix is ex-Chesterfield striker Kevin Davies who, despite his only managerial stint at Southport being largely unsuccessful, is amongst the bookies’ favourites after being sacked by the National League North side. Considering this wide range, yet only a handful, of candidates for the gaffer’s position, Evatt will need to prove himself over the last two games against Newport and Barnet if he is to be considered for the role. At a club with as difficult conditions as Chesterfield’s, knowledge and experience is paramount to bringing back happier times to the Proact Stadium, though stable ownership remains key. Without a doubt, Evatt exerts a passion as resonant as that of any supporter, but he should be wary that his inexperience does indeed put him at a disadvantage, especially when the club needs experience now more than ever before as it heads into the next chapter of an unknown future.